MIX all of the mentioned ingredients for the pizza dough into the stand mixer or by hand. COVER the bowl with a clean, dry kitchen towel. LET the dough rest for 1 or 1.5 hours on a warm spot. The pizza dough should be doubled in size after this time. 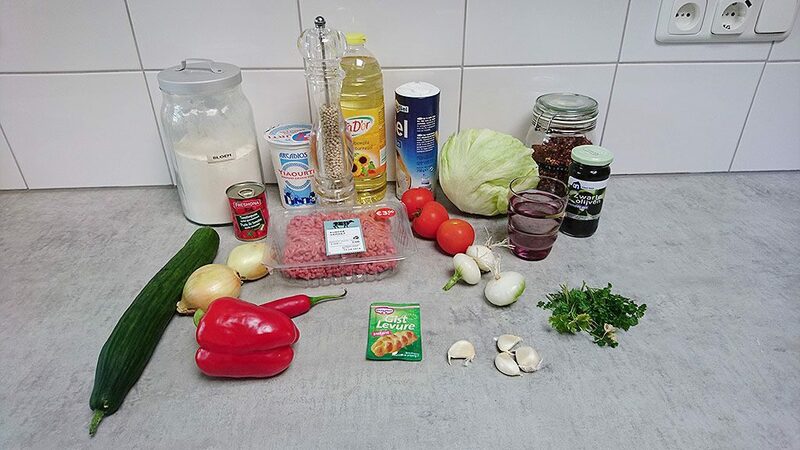 WHILE the pizza dough is resting, prepare the minced meat filling. COMBINE everything together in a large bowl. You can slice all of the ingredients by hand, or use a food processor for this. Try to cut everything as small as possible. MIX 500 gram minced lamb or beef into the filling. PLACE the filling into the refrigerator, until the dough is ready. CRUSH and slice the cloves of garlic, then mix everything together in a small bowl. Refrigerate. GRAB the dough and poke a few holes in it using your fingers, the dough should flatten a bit. DIVIDE the pizza dough into 10 equal balls. PLACE the balls of pizza dough under a kitchen towel to prevent them from drying out. FLOUR the workspace and roll a pizza dough ball as flat as possible. DIVIDE a few spoonfuls of filling over the pizza. HEAT up the large skillet on low heat, don’t add in any oil or butter. WHEN hot, add in the pizza. 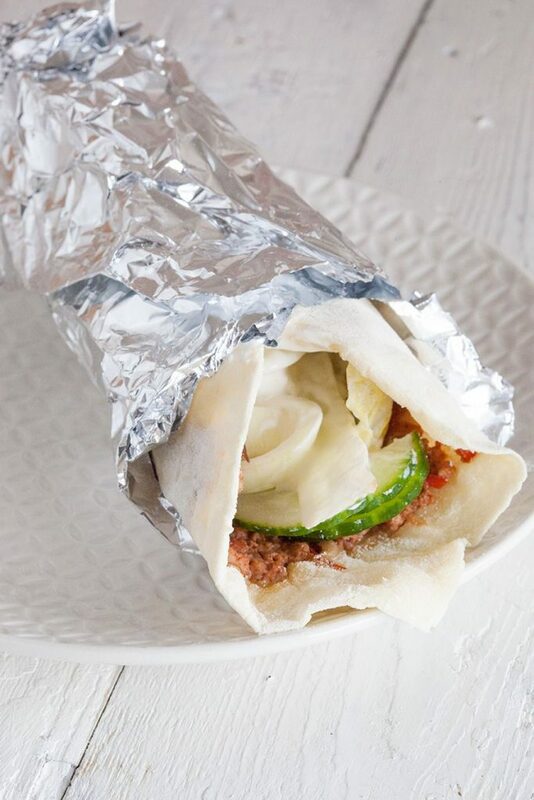 BAKE the Turkish pizza until the minced meat has been cooked. REMOVE the pizza from the pan and place it onto a large sheet of aluminum foil. COVER the pizza with the other half of aluminum foil. REPEAT the above step for the remaining dough balls. By covering the baked pizza in aluminum foil they will soften, thus easier to wrap (see picture). 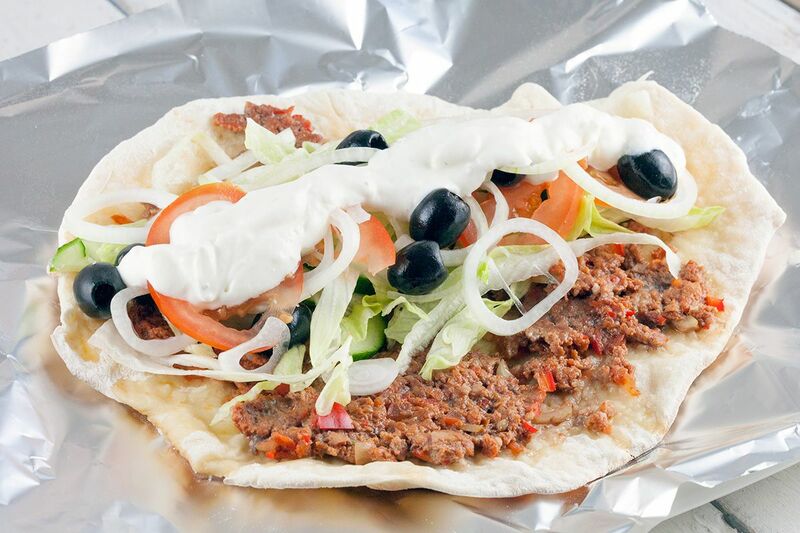 GRAB a Turkish pizza and cover it with the toppings. ADD garlic sauce and roll the pizza shut. Enjoy your Turkish pizza!